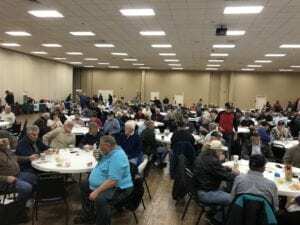 HIPSS (Healthcare Industry Professionals Serving Seniors) of Lexington hosted over 200 Veterans at the Richard Childress Racing site in Welcome, NC. 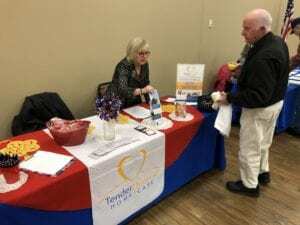 Members of HIPSS include businesses such as Home Health, Therapy, Transportation, Assisted Living, Skilled Care, Hospice and Palliative care, Senior Advisors, Retirement Communities and Home Care Agencies like TenderHearted Home Care. 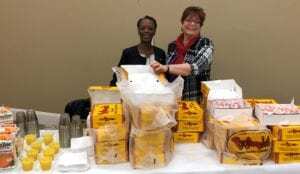 Pictured handing out Bojangles biscuits is owner, Renee Gray, and she is assisted by Danna Fleming of Brookstone Retirement. At the TenderHearted table display is marketer, Cindy Abel. Don Timmons with Trellis Supportive Care has organized several Veteran coffees across the Piedmont, with Richard Childress Racing being one of the sites hosting once a month. 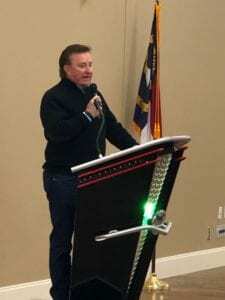 Richard Childress was present and thanked the Veterans and very graciously provides the building and staff to host every month. 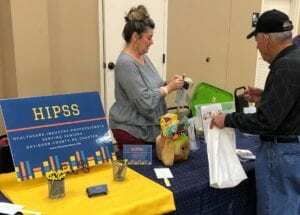 The president of HIPSS, Robert Garcia, also of Trellis Supportive Care, coordinated this event with other HIPSS members to provide for the biscuits and juice. It was inspiring to hear some of the stories of the veterans as they shared. All of the branches of service were present and recognized. Thank you Veterans for your service and sacrifices so we can enjoy the freedoms we have today in America! If you or an aging loved one are considering Home Care Services in Kannapolis NC, please contact the caring staff at TenderHearted Home Care today. (704) 612-4132.